The Hacienda Heights Library is offering Parent/Toddler workshops to parents with children to 3 years old. The five-part workshop gives parents an opportunity to spend some fun unstructured time with their children, learing together through imaginative and interactive play. Professionals from the community with expertise in child development will answer parents’ questions. The program is free, but space is limited and registration is required. Participants must register in person at the library in order to receive their information packet. The workshops will be held every Monday from 6 – 7:15 pm, beginning Sept. 22 in the library at 16010 La Monde St. For more information, call Paula Vannucci at (626) 968-9356. The Good Time Travel Club at the Steinmetz Senior Center will visit the Ports O’ Call in San Pedro for the world’s largest lobster festival this weekend. The festival features lobster meals, music, entertainment and tall ships on Saturday. The bus departs at 10 a.m. and returns by 4 p.m. from the Steinmetz Senior Center, 1545 S. Stimson Ave., Hacienda Heights. For more information, call (626) 934-7041. It’s time for the annual Hacienda Heights Health Fair at the Steinmetz Senior Center. Senior citizens may enjoy free 20 health screenings, plus insurance information, as well as health and fitness demonstrations. There will also be raffles and prizes from 9 a.m. to 1 p.m. Thursday in the senior center at 1545 S. Stimson Ave.
For more information, call (626) 934-7041. The Los Angeles County Police are holding Eagle Eye Park Watch meetings at local parks in connection with the Los Angeles County Sheriff’s Department. The meetings began in August and will continue through September and October. Meetings have been held at Manzanita and Steinmetz parks in Hacienda Heights, as well as in Rowland Heights and Pathfinder parks. Another meeting will be held 7 p.m. Wednesday in Rowland Heights Park. 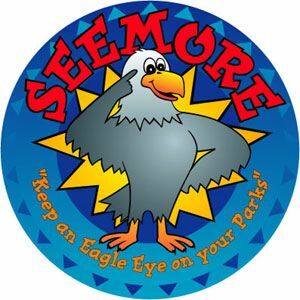 Much like a traditional Neighborhood Watch program, Eagle Eye asks residents to assume responsibility for the activities taking place in and around their park in order to help prevent crime and vandalism to park equipment. They also help curtail suspicious activities in parks. The Eagle Eye Neighborhood Park Watch Program was created by the Illinois Association of Park Districts. To date, 38 agencies in 12 states are members of the Eagle Eye family. Rachel Scott, the first person killed during the 1999 Columbine High School killings, left, and her brother Craig, who escaped being murdered but watched two of his friends, side by side to him, shot to death. Parents at Wilson High School in Hacienda Heights will get the chance to sign up for Rachel’s Challenge tonight from 6 p.m. to 8 p.m. in the school gym. Two presentations was given yesterday to the students. In other school activities, Orange Grove will hold its Back-to-School Night in the cafeteria at 6:30 p.m.
And Sparks Middle School will host a Back-to-School Night at 6 p.m. in the cafeteria. 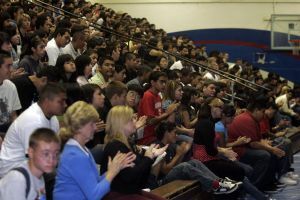 Rachel’s Challenge continues Monday at Wilson High School in Hacienda Heights. Last week the organization visited Los Altos and Workman high schools to spread the message that kindness matters. Assemblies will be held from 10:28-11:28 a.m. and 11:40-12:40 a.m. in the Wilson gym. Read about this powerful program in the Hacienda Heights Highlander. Knit one, purl two. Whatever, the Hacienda Heights Library is getting back to the Knitty Gritty Basics of Knitting. The four-week workshop will teach teens how to cast-on, cast-off, knit, purl, increase, and decrease. Classes will be held at 3:30 p.m. Mondays, beginning Sept. 15. Registration has already begun. Supplies will be provided, but teens can bring their own materials. Size 8 single point knitting needles and acrylic yarn are recommended. For more information, call Karen Noyes at (626) 968-9356. A free jewelry design workshop will be held 2 p.m. Saturday at the Hacienda Heights Library. Jewelry designer Victoria Kay Olguin will lead the class. Materials will be provided, so drop by the library at 16010 La Monde St. For more information, call (626) 968-9356. Friends of the Steinmetz Senior Center in Hacienda Heights will travel to Casino Pauma on Thursday to try their luck. The cost is $15, including transportation and $10 cash back. The bus leaves at 8 a.m. and comes back at 5 p.m. from the Senior Center at 1545 S. Stimson Ave. For more information, call (626) 934-7041.